One of the biggest draws to electric cars, aside from their positive environmental impact, is their relatively low cost of operation. In many areas, the cost of recharging an electric car is substantially cheaper than the cost of refueling a gasoline-powered car. If you could produce your own electricity, the cost advantages of an electric car would be even more apparent. Now, thanks to a partnership between Ford and SunPower called “Drive Green For Life,” you can do just that. Buyers of the 2012 Ford Focus Electric will get special pricing on a SunPower 2.5-kilowatt rooftop solar panel system, capable of generating an estimated 3,000 kilowatt-hours of electricity each year. 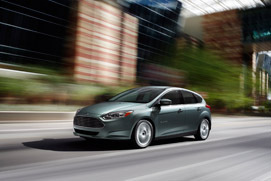 That’s enough to drive approximately 1,000 miles per month in your Focus Electric free of charge. That price also assumes that modifications to your house or electric service aren’t required. On the plus side, SunPower offers financing on their solar panel systems. If that kind of money is too much for you, Ford is quick to point out that conventional, 240-volt Level 2 charging stations for the Focus Electric and future Ford electric vehicles can be purchased through Best Buy. They don’t provide free electricity, but they cost substantially less to install.